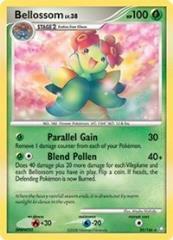 Attack 1: [G] Parallel Gain (30) Remove 1 damage counter from each of your Pokemon. Attack 2: [1G] Blend Pollen (40+) Does 40 damage plus 20 more damage for each Vileplume and each Bellossom you have in play. Flip a coin. If heads, the Defending Pokemon is now Burned.